In a few weeks I will visit my family in Germany (short step over before flying out to BALI) and thought about offering a yoga class. Some of them never tried yoga before, others know it from their gym. But how to start? I don’t want to simply do a beginners class with easy postures. I want them to really get how complete yoga can be. So I thought it should be more like a first introduction into Yoga: What is Yoga? What does a complete yoga practice on the mat include? These thoughts inspired me to write the following article. 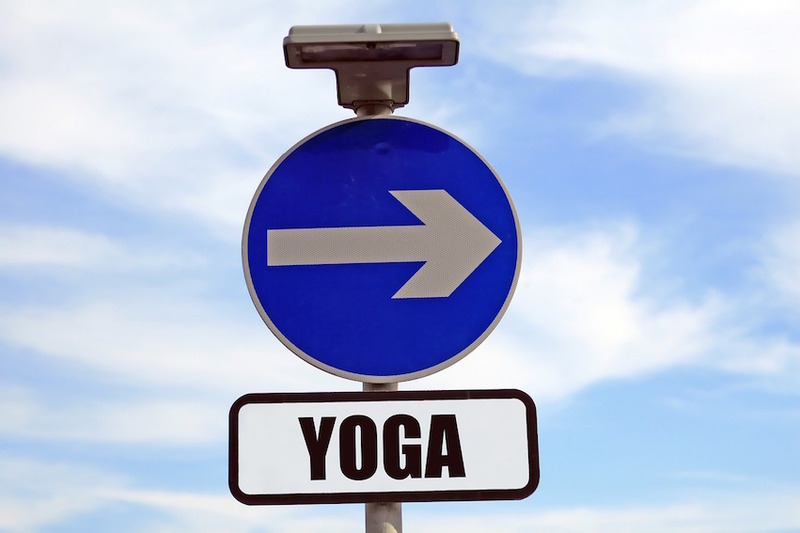 So in this Post I simply want to introduce Yoga, its basics and completeness on the mat. Learn about Hatha Yoga and its different elements. And why it is always Hatha Yoga the moment you step on the mat to do you Asanas. Todays yoga styles on the mat originate all from the same source: Hatha Yoga. Why? Simply because Hatha Yoga was the practice that first introduced the body into Yoga. Before the tantric movement (around 500 AC) the only known Asana was the comfortable seated position for meditation. The body was seen as an obstacle to overcome in order to reach enlightenment. But tantrists thought differently about that subject. For them the body was part of divinity and so can be a way to connect with the divine self. Hatha Yoga was born. They included the body as a way to reach the divine. Through the years other masters developed new styles like Ashtanga Vinyasa or Iyengar. And with its globalization of Yoga teachers from all over the world started to create modern types of yoga like Anusara or Yin Yoga. But all of them originate from Hatha Yoga. Hatha Yoga wants to reconnect the separated energies in order to recreate the divine whole. Thus the essence of Yoga is balance. With a complete Yoga practice we can balance the polarities not only in our body but in our emotions, character, everyday moods. We can balance our Self. That’s what Yoga is for: bringing balance into your life and experiencing union. Correctly used Yoga helps to re-connect to the parts we don’t want to feel, see or admit. But the more we oppress our inner voice, the louder it will be. Imbalances and disorders are the result of disconnection. So it’s very important to make space to experience and balance the polarities in your Yoga practice. Make space for every facet of your Self, feel it, connect and heal. 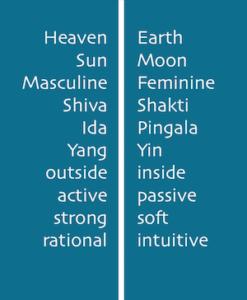 In a well rounded Hatha Yoga class you will find these polarities on your mat. Virabhadrasana is a good example. It’s a pose that represents strength and will power. You work on a strong and active body. But at the same time you can enjoy the steadiness and strength you connect in the pose. Keep your gaze soft but focused, your breath calm. This is practicing Yoga with balance. You see? Yoga is always about balance. And Hatha Yoga offers different tools to balance and keep your energy level. Learn now how to use them. Following I explain to you the different elements of Hatha Yoga. Each one of them is there to work with our Prana, our energy level in the body, in order to keep vital and healthy. The most well known part of Yoga in the West: the poses. Yoga is extremely beneficial for our physical health, helps to strengthen and lengthen out body, boosts our immune system and even helps us with our digestion. But beyond the physiological effects of asanas, those who practice them know: there something more powerful beyond the physical benefits of yoga poses. Our Asana, the pose should be stable and comfortable, steady and ease. That claims Patanjali in his Sutra. Balance between being strong and active, but able to rest and enjoy the pose from a passive and comfortable perspective. Again it’s all about keeping the balance. And according to your present personal state you can adapt your practice, make it more dynamic when you feel about getting an energy boost. Or you make it more restorative and slow paced to connect with the stillness in mind and body, reducing your stress level and relax. When you practice with an open and receptive attitude, your yoga practice might tell you how you are. When you feel less centered or undecided in life, balance poses might suddenly become more difficult. How you practice yoga is how you live your life. Observe it and be aware. Pranayamas are techniques to regulate the breath and so influence or vital energy. 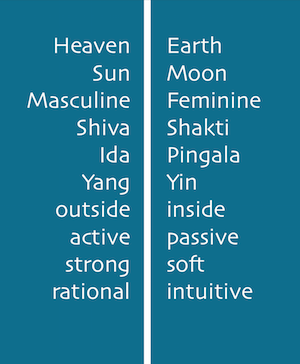 Prana means vital energy, ayam means expansion/extension. So its the extension of life force, of your vital energy through breathing. The breath is the most powerful tool yoga gives us in order to heal from within and connect with our inner self. If there’s no breath, there’s no yoga! So my lovely yogis, take care choosing your teacher. They should be conscious about the importance of the breath in the yoga practice on the mat. If not, it’s just a fitness program. Mudras are psychic or hand gestures, working with the 5 elements in the body. Our teacher said they are a medium of communication, of the pranic energy. So you could imagine, depending on the Mudra applying you are talking to your body. For example, if you want to have a clear mind and increase your concentration you apply Jnana Mudra. The “Mudra of wisdom” is probably the most known and practiced Mudra. Fingertip of the thumb touches tip of the index finger, activating pituitary and endocrine glands. It enhances concentration and a clear mind. Applying this Mudra helps to reduce insomnia, and relieves other psychological disorders, like depression. Just as we use Asanas to activate or Pranayama to regulate our energy, Bandhas are there to lock our energy in a certain physical or Chakra point. Closing or contracting an area in the body, we keep our energy locked in there. Jalandharabandha: Chin Lock, lowering chin to chest, closing the throat. Uddijanabandha: Pull abdomen in and up. Mulabandha: Root Lock, contracting muscles around pelvis floor. The last element to complete your Hatha Yoga practice are Kriyas. Kriyas are purification techniques. At home I grew up with the classic nose shower. In Yoga this technique to cleanse your nasal passages is called Neti. Probably most teachers don’t know how to include Kriyas in their classes because simply said: its a bit tricky to make people throwing up in the class room in order to cleanse your upper digestive system (Dhauti). Still there are two Kriyas you can easily include in your Hatha Yoga on the mat: Kapalabhati (fire breath) and Trataka (staring on a candle light increasing concentration, one pointness and cleansing your eyes). You see Hatha Yoga is much more than Asanas and Pranayama. All these elements are there to clean and purify body and mind. They are all very effective and perfectly adaptable to how you feel in order to manage imbalances caused by our lifestyle and other impulses from outside. Yoga is all about balance. And any disorder is caused by imbalances. Thus yoga has the power to prevent and cure diseases. But we don’t have to be aware only of our individual conditioning, but also cultural. You grow up in a certain environment, in a society, a culture. All that influence in your life balance. Our western is a very ego driven, active culture. And focused on the outside, looking for happiness in materialistic things. Always looking for more. That’s why I suggest a more introspective, slow paced type of Yoga for our western mind. I am convinced about the healing potential in Yin Yoga, especially for the western programmed mind. So please, when you practice Yoga, be aware about your ego, your mind. Choose a style to balance your cultural conditioning. In a faster, bodily demanding style, looking to achieve a crazy pose it’s much easier to trigger the ego, the competitive attitude to reach a pose, looking good and expecting positive feedback from your surroundings. Yoga is yoga when it is practiced with the right attitude towards yourself and your surroundings. It’s all about Love and Connection. In theory that might sound cheesy, but in practice it contains deep psychological concepts and healing power. When you practice yoga from your heart, with love and acceptance you work on other parts like self esteem, true self respect, your ego. When we enter in this moment of self love and harmony, free from stress and expectations our parasympathetic nervous system gets triggered and helps to keep the balance to the usually activated sympathetic nervous system during the fast, stressing day. In the softness you find strength, in stillness you find wisdom, in passiveness you find rest and renovation. There are parts in the list of dualism which are considered as less important or even seen in an negative way, like intuition, passiveness, stillness, softness. To everyone who consider these aspects less important: You couldn’t be more wrong. In the softness you find strength, in stillness you find wisdom, in passiveness you find rest and renovation. And Intuition. Well that can I say. Intuition is probably the most intelligent part that we can access to. Listen to your belly, listen to your heart and connect. There’s the true wisdom for, from and about yourself. No doctor, teacher, parent will ever be able to tell you whats best for you. You have it already inside of you. But only people who are in balance, in harmony with themselves, who love and accept themselves without competing or judging, are able to listen and follow their intuition. And yoga helps to connect to that love.